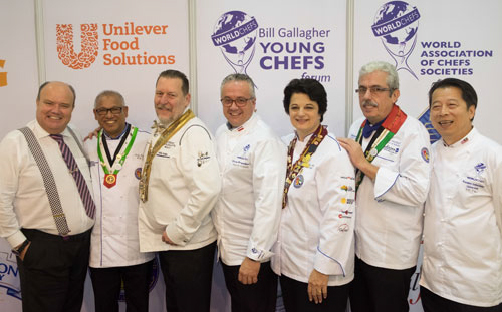 (L to R): Andy Cuthbert, Worldchefs Continental Director, Africa and Middle EastÍ¾ Tony Fernandes, executive chef/ f&b director, Crowne Plaza Toronto Airport and CCFCC Toronto culinary chairmanÍ¾ Thomas Gugler, Worldchefs presidentÍ¾ Martin Kobald, Worldchefs vicepresidentÍ¾ Cornelia Volino, CCFCC Toronto chairmanÍ¾ Uwe Micheel, Worldchefs assistant VPÍ¾ KK Yau, Worldchefs special advisor to Asia. This year, 26 international judges, alongside 12 UAEbased judges, presided. Winners included: Best Effort by an Individual Establishment — Dubai World Trade CenterÍ¾ Best Effort by a Corporation — Jumeirah GroupÍ¾ Best Cuisinier — Dubai International HotelÍ¾ and Best Kitchen Artist — Jumeirah Burj Al Arab.